Hawaiian Retreat! Stunning townhome with many upgrades to complete your Hawaiian Retreat. 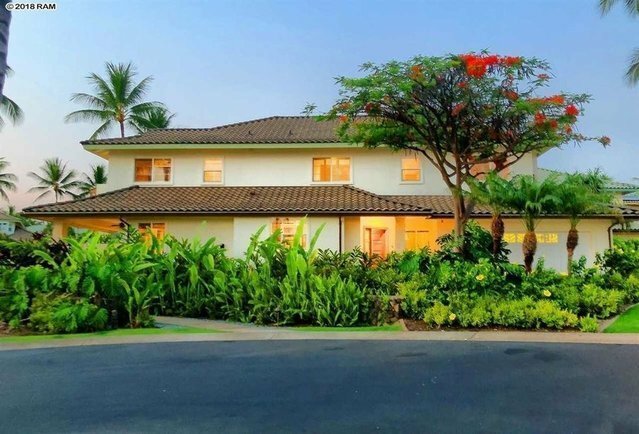 This 3 bedroom 2.5 bath Wailea jewel is tucked away on a quiet cul-de-sac location in the loved Kai Malu community in close proximity to all resort activities, shopping and dining. The main level lanai allows for easy entertainment on its extended travertine lanai with wet bar and Jenn Air upgraded BBQ. The great room enjoys the open floor plan with dining area and well equipped kitchen. There is a third bedroom presently used as an office downstairs plus a half bath. Upstairs the ensuite master opens through new sliding glass doors to an ocean view lanai. Ocean views are also enjoyed from the bed. The master bathroom has an incredible soaking tub, double sinks, separate shower, rare ceiling fan and the addition of overhead lighting in the closets. The second bedroom with traditional window seat with custom cushion and the second bath are located at the other wing of the townhome. There is a tub in the second bathroom. Additional interior upgrades include gorgeous floors, pull-outs in the kitchen and master bath cupboards, upgraded light fixtures and ceiling fans throughout, California shutters on upper level, and a custom finished garage floor which helps minimize dust. The garage has access via a direct private driveway allowing more space for parking for 2 additional vehicles. Community amenities include an infinity edge pool and hot tub with awe-inspiring ocean views, kitchen cabana with BBQ grill, steam room, sauna, fitness center and library. Gated entrance at 6pm every evening and weekends. This beautiful townhome is owner occupied with easy access for viewing with some notice.